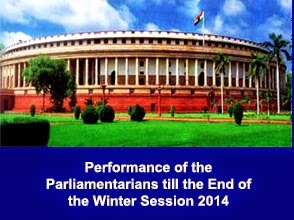 The winter session of the Parliament was held for 22 days from 24th November 2014 to 23rd Dec 2014. The Lok Sabha functioned smoothly and worked for 98% of the scheduled time. The Rajya Sabha functioned for only 59% of the scheduled time due to disruptions by the opposition parties. The Question Hour was more productive in the Lok Sabha than in the Rajya Sabha. A higher percentage of questions were answered in this session than in any other session in the past ten years. On the contrary, the Question Hour in the Rajya Sabha lasted only 3 minutes on 15 days, out of 22 days of this session. The credit for the smooth functioning of the Lok Sabha and particularly the Question Hour goes to Smt Sumitra Mahajan, Hon’ble Speaker, who handled firmly whenever disruptions were caused in the House. Generally, the performance of the members can be assessed by their participation in the debates, in raising questions, in the introduction of private members bills and in their attendance. The cumulative performance of the members from the beginning of the first session till the end of third session (4.6.2014 to 23.12.2014) was analysed. Our analysis is based on the data released by the PRS Legislative Research (www.prsindia.org). The Parliament functioned for 55 days during these three sessions. Among the States, the Kerala MPs participated in an average of 23.8 debates, followed by Rajasthan scoring 13.4 in the three sessions. The national average is 8.6. The following two Members have emerged toppers for participation in debates in the entire 16th Lok Sabha. Private Members Bills provide an opportunity to individual members to introduce any bill individually, without the permission of their respective parties. There have been instances where private bills have been accepted by the Government for introduction as a regular bill. Even if the bill is not accepted, a detailed debate is allowed on the subject. The following two members have emerged toppers under this category in the entire 16th Lok Sabha. A total of 129 Private Members Bills have been introduced by 40 Members by the end of the winter session. Raising questions in an important tool in the hands of MPs to bring focus on important public matters for which the Ministers concerned need to provide their reply either orally in the Parliament or in writing. The members can ask supplementary questions and challenge the Ministers. A total of 18,989 Questions (including supplementary questions) have been raised by the Members and replied by the Government till the end of the winter session. Among the States, Kerala tops the list with an average of 82 questions per member, followed by Maharashtra with an average of 81 per member. The national average is 38. The following two MPs are in the top position under the Questions category in the entire 16th Lok Sabha. 65 MPs have secured 100% attendance in the entire 16th Lok Sabha. The national average for attendance is 85%. Among the States, Tamil Nadu leads with an average attendance of 94% followed by Uttar Pradesh with an average attendance of 91%. The overall performance score of Tamil Nadu is 43.1 and that of Uttar Pradesh is 28.8. Although their MPs have been attending the sessions regularly, their overall score is far below the national average of 46.9. Probably, these two states have sent large contingents of MPs belonging to the same party (AIADMK / BJP) and most of them are new MPs. These respective parties should take initiatives to provide adequate training to their new MPs about the functions of the Parliament. Kerala and Maharashtra have an average attendance of 84% and 81% respectively. Kerala and Maharashtra top in their overall performance score by securing 106.8 points and 90 points respectively, as against the national average of 46.9. The top performers of the Parliament for the 16th Lok Sabha session, Arjun Ram Meghwal, Supriya Sule and Shivaji Adhalrao Patil were the ‘Sansad Ratna Awardees’ for the 15th Lok Sabha. The Award was instituted by Prime Point Foundation and this ezine, PreSense. As most of the MPs were new, no analysis was undertaken for this category. The respective political parties should analyse the performance of their own members and mentor them for better performance in future sessions. PreSense Congratulates the Members and States who have shown good performance.